Candle rulebook #1 – a true candle lover never lets a good opportunity go to waste. That’s what I told myself when I saw this vintage set of luxury candles at Costco. Costco of all places! I was there to buy office supplies and I ended up walking out with three candles instead. You can smell each fragrance through an opening in the box so you will know immediately if you like each scent or not. In my case… I liked all three. Also want to point out… these candles are made with pure essential oils which is amazing considering how inexpensive this boxed set was. And boy are these candles pretty. Each vessel does look vintage and old world from the color, labeling and rough edges around the rim of each candle. So far, I’m super impressed. I’ll be reviewing each scent on its own page – links below. Havana Cinnamon from Essenza was purchased in a 3 pack at Costco. It's a pretty inexpensive brand and lovely candles that are pre-boxed and excellent for gift giving. Mandarin Cilantro was purchased in a 3 pack from Costco. I'm really enjoying these candles. The price is right and the scents are pretty darn good to burn in small rooms. This fragrance smelled wonderful. A fresh citrus orange. 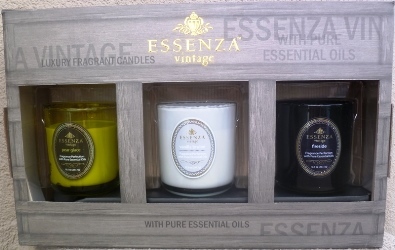 Fireside from Essenza was one scent that came in a three pack I purchased at Costco. What a deal! 3 luxury candles for twenty dollars.. This scent smelled like a classic smokey wood scent. It was pretty masculine, one I really enjoyed.